Agrionemys horsfieldii, the Central Asian or Horsfield’s tortoise, is a member of Testudinidae within Cryptodira. It was formerly considered part of the genus Testudo, and is closely related to Testudo hermanni (Ernst and Barbour, 1989; Bonin et al., 2006). Testudinidae is a large and diverse family of extinct and extant terrestrial forms, and includes well-known giant species such as the Galápagos and Aldabra tortoises. Testudinidae is closely related to the Old- and New-World pond turtles (Geoemydidae and Emydidae, respectively), but the relationship of these three close relatives to other turtles is unclear (e.g., Gaffney and Meylan, 1988; Joyce, 2007). Agrionemys horsfieldii is a moderately-sized tortoise, reaching a carapace length of up to 22 cm (Ernst and Barbour, 1989) . 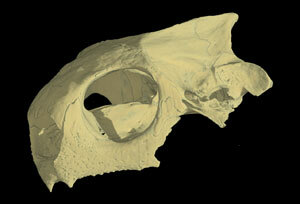 The skull is of moderate size and has a hooked upper jaw. The carapace is dorsally flattened and approximately twice as long as high. The plastron is well-developed but lacks a hinge. Large overlapping scales are present on the forelimbs, and spur-like scales are present on the heel. The carapace ranges in color from light brown to yellowish brown with dark-brown pigmentation. 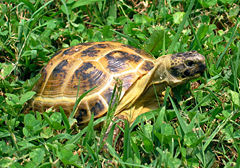 The plastron is black with yellow seams, and the head and limbs are yellowish-brown (Ernst and Barbour, 1989; Bonin et al., 2006). Agrionemys horsfieldii has an extensive range, and is found in Pakistan, Iran, and Afghanistan, extending into western China and southeastern Russia (Ernst and Barbour, 1989; Bonin et al., 2006). It inhabits areas of relatively lush vegetation in dry, rocky areas including deserts, steppes, and hillsides. It may dig burrows for hibernation in northern parts of its range, and for estivation in southern areas (Ernst and Barbour, 1989; Bonin et al., 2006). Agrionemys horsfieldii is herbivorous, and is able to subsist on metabolic water. Females lay up to four clutches of three to five eggs each year (Ernst and Barbour, 1989; Bonin et al., 2006). Agrionemys horsfieldii is listed by the IUCN as vulnerable. 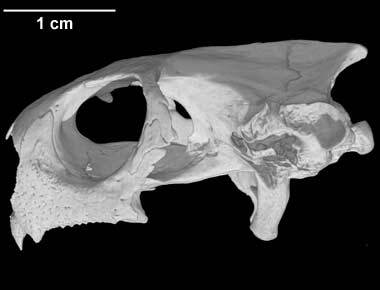 This specimen was made available to the University of Texas High-Resolution X-ray CT Facility for scanning by Dr. Heather Jamniczky of the University of Calgary. Funding was provided by Dr. Jamniczky and by a National Science Foundation Digital Libraries Initiative grant to Dr. Timothy Rowe of the University of Texas at Austin. This specimen was scanned by Matthew Colbert on 5 August 2004 along the coronal axis for a total of 570 slices. Each 1024 x 1024 pixel slice is 0.055 mm thick with an interslice spacing 0.055 mm and a field of reconstruction = 26 mm. Bickham, J.W. and J.L. Carr. 1983. Taxonomy and phylogeny of the higher categories of cryptodiran turtles based on a cladistic analysis of chromosomal data. Copeia 1983:918-932. Bonin, F., Devaux, B., and A. Dupré. 2006. Turtles of the World. Translated by P.C.H. Pritchard. Johns Hopkins University Press, Baltimore MD. Ernst, C.H. and R.W. Barbour. 1989. Turtles of the World. Smithsonian Institution Press, Washington DC. Ferri, V. 2002. Turtles and Tortoises. Firefly Books, Willowdale, ON. Gaffney, E.S. 1972. An illustrated glossary of turtle skull nomenclature. American Museum Novitates 2486:1-33. Gaffney, E.S. 1979. Comparative cranial morphology of recent and fossil turtles. Bulletin of the American Museum of Natural History 164:1-376. Gaffney, E.S. and P.A. Meylan. 1988. A phylogeny of turtles. In: Benton, M.J., editor. The Phylogeny and Classification of the Tetrapods, Volume 1: Amphibians, Reptiles, Birds. Clarendon Press, Oxford, pp. 157-219. IUCN 2006. 2006 IUCN Red List of Threatened Species (On-line). Accessed 28 March 2007 at http://www.iucnredlist.org. Johnston, E.E., Rand, M.S. and S.G. Zweifel. 2006. Detection of multiple paternity and sperm storage in a captive colony of the central Asian tortoise, Testudo horsfieldii. Canadian Journal of Zoology 84:520-526. Joyce, W.G. 2007. A phylogeny of Mesozoic turtles. Bulletin of the Peabody Museum of Natural History 48:3-102. Lagarde, F.R., Bonnet, X., Corbin, J., Henen, B., Nagy, K., Mardonov, B. and G. Naulleau. 2003. Foraging behaviour and diet of an ectothermic herbivore: Testudo horsfieldi. Ecography 26:236-242. Lagarde, F., Bonnet, X., Henen, B.T., Corbin, J., Nagy, K.A. and G. Naulleau. 2001. Sexual size dimorphism in steppe tortoises (Testudo horsfieldi): growth, maturity, and individual variation. Canadian Journal of Zoology 79:1433-1441. Orenstein, R. 2001. Turtles, Tortoises, and Terrapins: Survivors in Armor. Firefly Books, Buffalo, NY. Parham, J.F., Macey, J.R., Papenfuss, T.J., Feldman, C.R., Turkozan, O., Polymeni, R. and J. Boore. 2006. The phylogeny of Mediterranean tortoises and their close relatives based on complete mitochondrial genome sequences from museum specimens. Molecular Phylogenetics and Evolution 38:50-64. Pritchard, P.C.H. 1979. Encyclopedia of Turtles. TFH Publishing, Neptune FL. Shaffer, H.B., Meylan, P., and M.L. McKnight. 1997. Tests of turtle phylogeny: molecular, morphological, and paleontological approaches. Systematic Biology 46:235-268. Wuntke, B. and R. Siegmund. 1992. Preferent temperature and locomotor activity in turtles (Agrionemys horsfieldii Gray), diurnal and seasonal rhythmicity. Journal of Interdisciplinary Cycle Research 23:56-64. To cite this page: Dr. Heather A. Jamniczky, Dr. Anthony P. Russell, University of Calgary, 2007, "Agrionemys (Testudo) horsfieldii" (On-line), Digital Morphology. Accessed April 25, 2019 at http://digimorph.org/specimens/Testudo_horsfieldi/.